Thanks Arthur for this excellent summation! These containers (or accounts) are bounded and have rules that govern what happens inside them, as well as what happens as they interact with other containers. I think it might be worth looking at the subject / predicate form in this light a little. Words in many ways seem to be containers. The sentence, "The sky is blue." puts the sky in one container (differentiated from the ground), and relates it with blue (differentiated from other colors). It interesting to note in this context that in reality the color spectrum is continuous rather than separated, integrated rather than differentiated. We have merely drawn lines in certain places in the spectrum and defined those as colors. 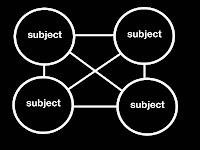 So a subject / predicate sentence draws one container (subject) and relates it to another (predicate). Even in the case of "The sun rises." we have a container around the idea of rising and know that there is some quality of action that can be differentiated from other actions that is similar to what the tides do and what bread does. 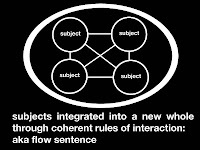 So a flow language probably still needs containers of some sort, but what makes it different from subject / predicate is that instead of mapping linear piece-meal relationships between containers it maps a collection of relationships that when perceived / expressed together make up a greater holon of some sort. To the extent it needs to define containers, it differentiates, and to the extent it maps wholes, it integrates. 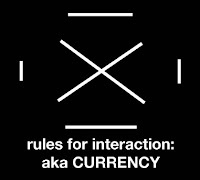 It is these rules for interactions between subjects (and indeed the rules that define the subjects we are dealing with in the first place), that are the CURRENCY. This is distinct from the actual manifest state of the system at any given time, and from the list of potential states of the system. The currency is instead the process through which these states may be realized. Particular processes will, through playing out, create basins of attraction around certain system states. I am reminded of the butterfly effect. The butterfly graph of the Lorenz attractor in phase space shows a bounded state of possibilities for the system, but it can't predict what state the system will be in at a given time, and indeed there are an infinite number of potential states. So, these subjects are integrated into a new whole that is bound by these interactions between them. It is the rules themselves that enable the integration into a larger whole. Without a coherent rule set, the parts would simply be heaps rather than new wholes. It also might be the case that not every rule set produces coherent and functional wholes, but that determination seems like it would have to play out over time. Again, I am reminded of chaotic systems that, over time move towards basins of attraction. Different currency rule sets, would likely create different basins of attraction. This concept is made more complicated by the fact that a representation of the state of the system as a whole could be in a container as a part of its own system. This is analogous to the play itself being a character in the play. The ability of systems to represent themselves to themselves becomes an important way for the system to feedback on itself (and maintain stability). The rules governing the system (or one CURRENCY within the currency complex) would include rules about how to represent the whole as a subject within the whole. This might be a round about way of describing the nature of a holoptic view. 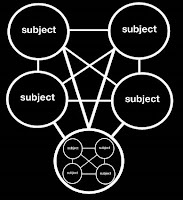 If subjects can interact with the whole, then that representation of the whole becomes a discreet part within the whole itself. The holoptic view would have to filter data about the whole and construct some sort of representation of the whole with that data that the parts can interact with. This is kind of mind bending stuff, I'd say! This is great stuff. One thing I'll point out is that the distinction of the pattern that governs the whole vs the particular state that the whole is in is very similar to what it is to write a computer program, and then to watch it actually run. Governing pattern <-> particular outcome.